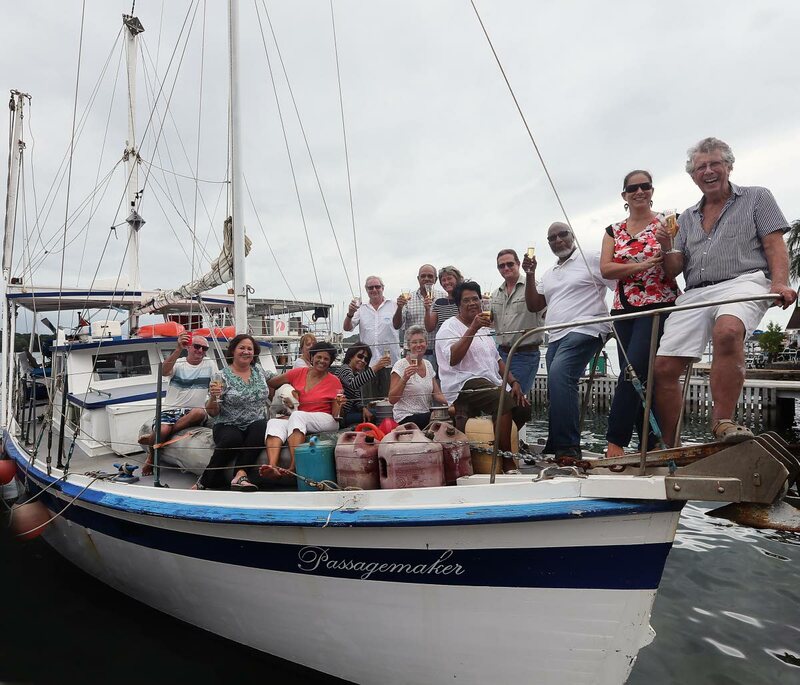 Sea conquerer: Adventurer Peter Quentrall-Thomas celebrates aboard the Passagemaker in Chaguaramas on Friday with his wife and friends after sailing across the Atlantic Ocean. A past president of the Energy Chamber and chairman of the Point Lisas Industrial Corporation, Peter Quentrall-Thomas is the first Trinidadian to make a solo crossing across the Atlantic Ocean, travelling almost 3,000 miles, non-stop in 19 days. His vessel, the beautiful white and blue Passagemaker, is 55 years old, built of 35 tonnes of Burmese teak, and powered by a 30-year-old Ford diesel engine. Quentrall-Thomas said it was a personal challenge to make this crossing on his own. Now 71, it was his decision to retire at 60 to “make room for the next generation”. “At that age, technology has rendered you obsolete. If you are not up to date you cannot suggest the best solutions. (David) Cameron was 43 when he became the prime minister of the United Kingdom. (Barack) Obama was 48 when he became president of the United States,” Quentrall-Thomas said during an interview aboard the Passagemaker on Friday. The journey had its hiccups when Big Bertha decided to die on him. That is his engine, by the way. “The sound of your engine dying is not a happy one. It turned out the fuel pump on the side of the engine had broken and he had to get it up and running as quickly as possible. “This was one occasion when being a mechanic was handier than being a brain surgeon,” Quentrall-Thomas said, none the worse for wear. Born in England, Quentrall-Thomas came to Trinidad 40 years ago and attended Pleasantville Senior Comprehensive School. He was an entrepreneur at 30 and learned to use his hands, a Jack of all trades. “I was working in Iraq building a training centre. There was no music, no alcohol and no women to even look at. I arrived ten days before Carnival in 1976 and I thought I had died and gone to heaven. I fell head over heels in love with the country,” he said. After retiring, Quentrall-Thomas realised he was bored out of his mind, but refused to go back to work. “I reinvented myself. I decided to buy an old wooden boat, I would repair it and I would go sailing. I paid $90,000 for this boat which was a bargain. She is all made of teak. There is no plastic or fibre glass or steel. I have sailed up the Amazon River and back, to Cuba, Mexico, Panama... sailing opened up a new lease on my life. When I made my first trip through the Caribbean and when I got back everyone was saying ‘boy, you are looking so young.’ It wasn’t that I went to any beauty spa, it was just the excitement of doing something new. 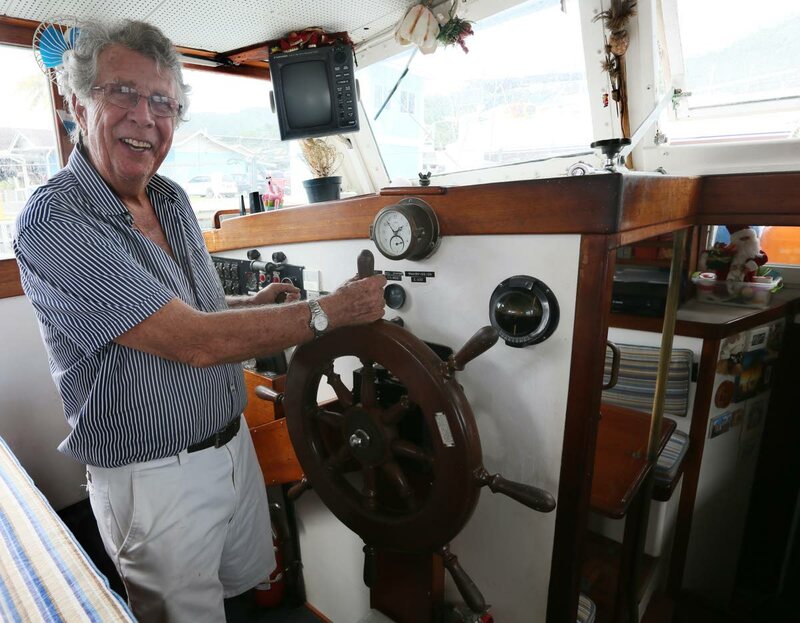 I lost some weight because it is like all day aerobics,” he said, demonstrating the way he had to use the handholds while navigating through the vessel. He described it as 24-0-7 aerobics. His wife Louise, a South African, enjoys her travels with her husband. “It is a hard thing to live with your companion 24-7 in such a small space, but we share the same sense of humour and it is experiencing life together. We have our arguments, but we work our way through,” she said, as she patted their companion dog Coco who was trying to use her cuteness to get bits of food. Quentrall-Thomas said if he had to do it all over again, he would just try to do it much more slowly. “I have no regrets...I have a reason to go on, it keeps me young,” he said. Reply to "Sailing the seas at 71"